Never looked better! Photo by Tim Graham. I have just about had it with all the coverage of the late Diana, Princess of Wales, because of the looming 20th anniversary of her death at the end of the month. It seems to be everywhere—during national news broadcasts, as prime time specials, and stories galore over at the Daily Mail. Enough already! I can’t believe there are any more “secrets” to be discovered about her marriage or life or final days! Four stories I have actually enjoyed were written by Sarah Rainey and all were about her jewelry—what she owned before she married Prince Charles, pieces she was given as wedding presents, and what she liked and did not like when it came to gems. Now those are articles I can appreciate! I love stories that tell you about a woman’s jewelry collection. You can find the articles by clicking here and here and here and here. I highly recommend all of them and will add updates if Ms. Rainey writes anymore. Do note that readers of the fourth article complained that there were many mistakes made by the writer in doing her research. I do not know enough about the jewelry belonging to Diana or the Crown to have an opinion on this so read all the articles with a grain of salt! 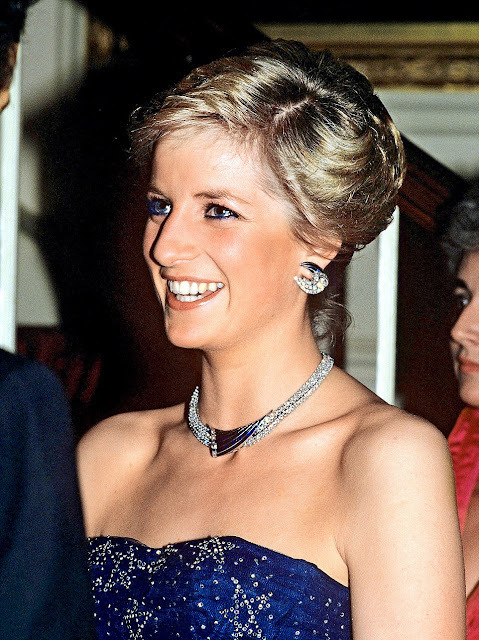 Looking over the photographs of Diana in fabulous jewelry reminded me what a star she was in her time. I still miss her. I am including three of my favorite photos of Diana from the articles. 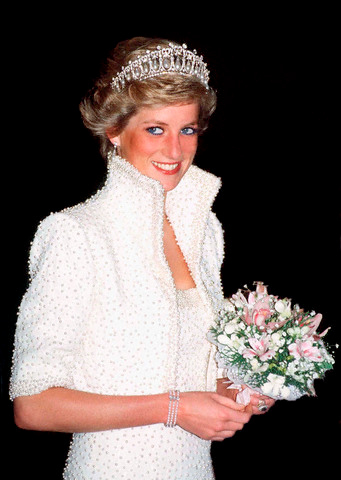 The photo above, of Diana in the Catherine Walker pearl-encrusted “Elvis” dress in Hong Kong in 1989, is my absolute favorite of her. I laugh every time I see it. She looks so young, so gorgeous, and also up to no good. Love it! She is wearing the famous Cambridge Lover’s Knot tiara, a wedding gift to her from the Queen. I honestly don’t think anyone will ever wear it better. Sorry, Kate! Gorgeous in emerald green and borrowed diamonds for her engagement portraits in 1981. Photo by Lord Snowdon. I remember how beautiful I thought Diana looked when I saw this picture of her in emerald green silk taffeta and diamonds, back when I was 12, and I still absolutely love it. Ms. Rainey writes that the diamonds were on loan from Collingwood, the Spencer family jewelers, chosen by Diana for the sitting, and that Collingwood wanted to give the set to her for a wedding present but the palace told her it was inappropriate for her to accept it. She did continue to borrow them, however, for various formal events! Diana in 1987. Photo by Nils Jorgensen. I don’t recall this earring and necklace set but I love it on her! They were a gift from the Sultan of Oman in 1986 and the article said she loved the modern design of them. Me too! I also love all that blue at her eyes. Remember that, everybody? Blue eyeliner AND blue mascara?!? I was 17 so I was wearing this eye-makeup look too, ha ha! Let me know if you have a favorite piece of jewelry from Diana’s collection, anything you especially loved seeing on her. I don't have a fave piece of Di jewelry but am with you on the Diana revelations the Daily Mail has been giving headline coverage. Unfortunately, it appears none of her friends will take any Diana secrets to their grave. Don't recall the 'Elvis' dress...glad she never did a Fat Elvis rhinestone encrusted jumpsuit with peanut butter and banana sammichs....hold the GSL, "Don't Be Cruel"
GSL has left the building. Hi Jill, I absolutely agree with you that the Cambridge Walker tiara was worn best by Diana. She rocked it. The sapphire engagement is so iconic. Whenever you see that style, you immediately think of Diana. The jewelry of the 80's was big like the 80's. And, with her height and slimness, she could carry off any kind of jewelry. Tried to watch the Diana Documentary last nite & it brought back the memories of how the press hounded her & how disloyal so many of those close to her were. So, I just said enough and stopped watching. I remember on my first trip to London in 2000, a friend and I went to see Diana's dresses on display at Kensington Palace. That was a highlight of my trip. I also remember that I had to start back to school (as a teacher) a day or so after her death in 1997, and the girls in my class were devastated. Hi Rosie! Yes, I agree, she could pull off big jewelry because of her height. I tell you, after she died, I felt terribly guilty for any time I had read anything about her, looked at pictures of her, etc. I thought, My curiosity is part of why she was chased to her death! I skipped watching any of the recent documentaries because I knew they would make me sad. I remember about Gianni Versace being killed the same year. I can still see that picture in my mind of her consoling Elton John at Versace's funeral. So eerie where the two of them would be on September 6 of that same year! Hi Sue! How are you? You are so lucky to have seen that exhibition I bet it was wonderful! I was pretty upset when Diana died so I sympathize with how your students felt. I think I was in shock for days. I brought flowers to the British Embassy in Manhattan and also signed the condolence book for William and Harry. She was a unique lady and she is still missed!